The beloved Evil Dead trilogy always seemed like a perfect fit for video games, with the likeable (and shotgun toting) hero, Ash, as well as a never ending hoard of nasty deadites. Besides, the guy has a chainsaw for an arm. Instant win. 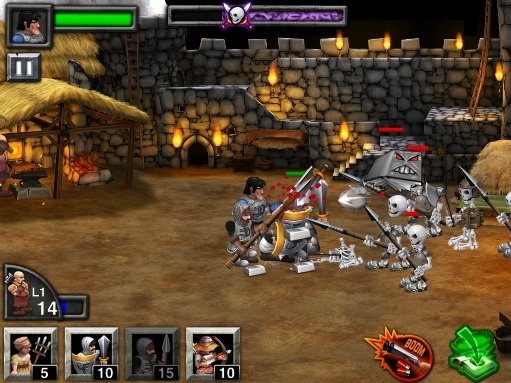 That said, the previously released Evil Dead titles have been crap, to put it mildly, but there's finally a great one in the form of Army of Darkness Defense, Backflip Studios' humorous, attractive and addictive tower defense App for both iPhone and iPad that renews our faith in movie based games. At first, the concept of merging the third film with tower defense appeared to be disastrous, and yet it works so brilliantly. Set in medieval times, you (as Ash) must prevent an army of deadites from capturing the Necronomicon, AKA the book of the dead, while at the same time protecting Lord Arthur's castle. To do this, you move Ash left and right across the screen, put him into position and unleash hell upon the game's many enemies; Ash fires his shotgun automatically. At the same time, you have the option of bringing a variety of units into battle, and these guys run the proverbial gamut, from relatively weak peasants to swordsmen, spearmen and archers; you must choose five units before each stage. More importantly, to keep things balanced, the developers tie everything to the blacksmith, who accumulates points the longer he works. All unites cost a certain number of points (peasants are five, swordsmen ten and so forth), so you must use said points wisely. Taking this a step further, you earn gold coins during and after battle (win or lose) that go towards upgrading Ash and those aforementioned units, which make them stronger or outfit Ash with a new weapon like the chainsaw. You'll even gain access to unique skills that pack a wallop and recharge over time, such as a book that absorbs bad guys, arrows that rain from the sky and a super shotgun attack. All of this combines to form one of the more refreshing tower defense games we've played in quite some time, and the icing on the cake comes in the form of voice work from Evil Dead alum Bruce Campbell, who delivers classic lines with gusto. It's the ultimate form of fan service. All of this aside, our only complaint involves a lack of variety in key areas, namely scenery and music. We quickly grew tired of defending the same castle area and listening to the same old tracks. 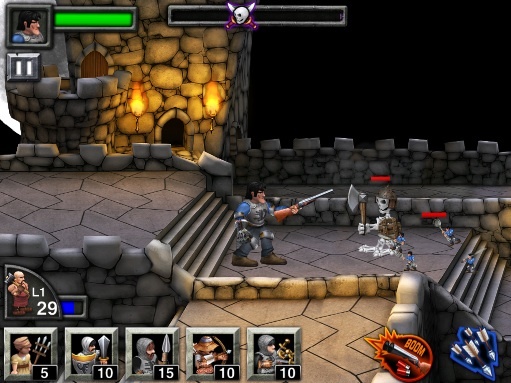 On that note, Army of Darkness Defense still manages to shine, and we strongly suggest downloading it, regardless of whether you're into the Evil Dead films. Kudos to Backflip Studios for respecting the license while at the same time delivering a highly entertaining experience. What's Hot: Addictive tower defense gameplay, over 100 quotes from the movie, Bruce Campbell, sharp looking graphics, 50 waves of enemies. What's Not: iPad version costs extra, not enough music and backgrounds.